It’s a fact that scuba divers generally spend more time on a boat than under the boat, and this is were the seasickness problem roots. Whether it is because one suffers from seasickness in general, or because one heads out to the open ocean on rough seas, it seems that every scuba divers has a story about being seasick! What causes seasickness and how to prevent it? The answer is different for all of us and depends on the situation, but let’s look at some tips you could use on your next diving trip. Seasickness is a motion sickness that some people experiment almost every time they’re on a boat, and others only on choppy seas. Let’s keep this simple and go with the mainstream explanation for the seasickness of most people (cause yes there are many theories and we could argue for hours). This explanation is that motion sickness is a brain response to opposite signals coming from your eyes and ear balance. Indeed, while the eyes see things and the horizon line as stable, your inner ear feels that nothing is stable. In other words, you brain gets all messed up with too many new environmental stimuli that differ from what it’s used to on the land. How to overcome seasickness when going diving? Understanding what causes motion sickness is the first step in overcoming it as it gives you a hint on what to do and what not to do. Note that there is not one miraculous way to prevent this issue, but many tips that might work to help you feel better, less seasick. Now, we will look into some tips to prevent seasickness on a daily diving excursion. Plus, we will give some extra advice on preventing seasickness on a liveaboard diving cruise. First things first; it’s essential that you are aware of the diving conditions of the destination that you choose. In fact, some destinations are known to have choppy seas especially during monsoon seasons. Thus, this tip applies mostly to scuba divers that have established the fact that they get seasick more often than not. Indeed, if you know that you are seasick, favor destinations where you can dive from shore or on shielded inlets, harbors, etc. The point is that you should avoid open ocean dives off-season and destinations known for rough seas such as Costa-Rica’s Cocos Island. That’s a good start, and for the rest… equip yourself with pills and read the tips below! This might be the last thing you were expecting as an advice on how to prevent seasickness but it is crucial that you stay hydrated. When we travel we tend to eat out in restaurants, where water is often not free, and where we tend to drink sugary stuff or alcohol instead. Plus, do we drink enough water to compensate for the physical activity and hot weather of most diving destinations such as Indonesia or the Maldives? Maybe not. Mostly not. So, first step to be aware of : increase your daily water intake! 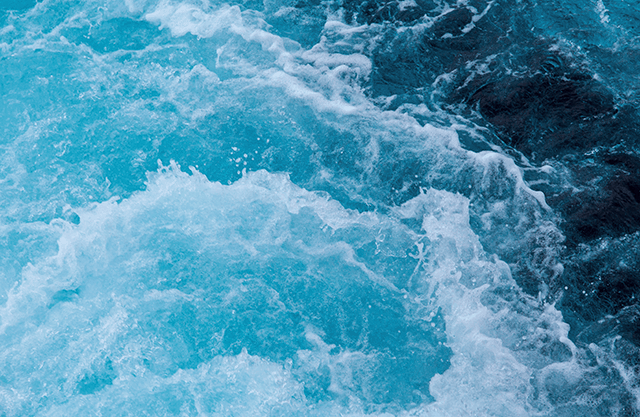 Now, what does hydration has to do with seasickness? Simply that being adequately hydrated allows a better brain and body response to stressful factors such as confusing stimuli being signaled to your brain. Stay outside, face towards the direction where the boat is heading and look away to the horizon. In fact, many people report that looking away is better than closing your eyes or looking at objects and structures nearby. This would make sense as your eyes will be more in line with the movement signals your brain gets from your ears. Plus, staying outside whenever possible is great so you can look away and take deep breaths of fresh air. 4. To eat or not to eat to prevent seasickness? Even though many people will board a ship with an empty stomach by fear of throwing up, they might not be doing themselves a favor. Indeed, the lack of food can itself upset your stomach and/or make you feel nauseous, thus adding to the problem. The best case scenario would be to eat healthy carbs about 1 to 2 hours before boarding the diving boat. No junk, no acidic food, just good carbs and proteins to fuel your diving adventure and set your stomach straight. All of the tips above apply also during a diving cruise. Thus, it’s very important that you stay over-hydrated, especially if enjoying some wine with dinner on the boat. Plus, if you are seasick and taking medicine to treat it, make sure alcohol is not prohibited with your pills. Also, eat normally, meaning not to less and not too much. Furthermore, ask for a room located mid-ship when you book your diving cruise. Indeed, this will help reduces the movement, thus the contradictory signals sent to your brain. Plus, choosing bigger liveaboard boats is the best if you are prone to seasickness as bigger ships tend to be more stable on the water. Finally, we hear a lot about munching on ginger as a help against nausea and avoiding greasy or spicy food. As you can see, the pieces of advice are many and what truly matters is that you find the best combination that works for you.